Submitted Photo Some of the many participants of the 2014 Walk to end Alzheimer’s Walk in Portsmouth. The annual Portsmouth Walk to End Alzheimer’s has been scheduled for Saturday, Sept. 19. The goal of the walk is to raise funds for the Alzheimer’s Association of Greater Cincinnati, which serves families in Scioto, Jackson, Lawrence, Vinton and Gallia counties. The 2014 Portsmouth Walk to End Alzheimer’s had 370 participants that raised a collective $31,000. Top fundraising of the 2014 walk was USSA Adult Day Center which raised $5,460. 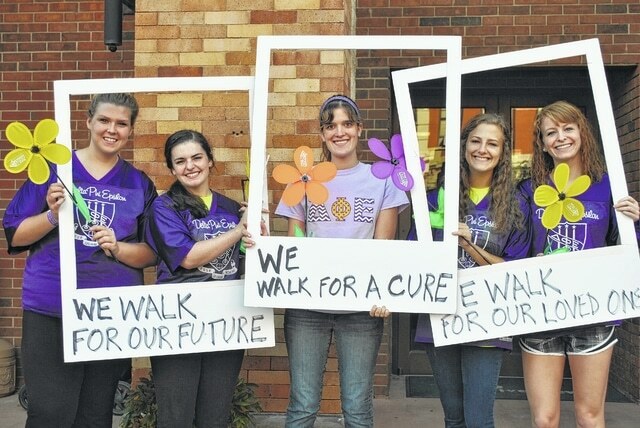 The top individual fundraisers for the 2014 walk were Jamie Williams of Portsmouth who raised $2,895, Angelina Simmons of London who raised $2,285 and Mary Ann Hill of Portsmouth who raised $2,090. “Alzheimer’s disease touches many families in Portsmouth and throughout southeastern Ohio. The Walk is a way for the community to come together in support of these families and the many important programs and services we provide,” said Jeff Dehner, Special Events coordinator with the Alzheimer’s Association of Greater Cincinnati in a released statement. An estimated 6,000 people participated in five regional Walks last year, raising a record total of $770,000 to support local programs and services and to fund national Alzheimer’s research. The Portsmouth Walk to End Alzheimer’s will be held on Saturday, Sept. 19, at Market Square in Portsmouth. Registration will begin at 9 a.m. The Walk starts at 10 a.m. Online registration is available for the walk at www.alz.org/cincinnati. For more information on the Walk, call Dehner at (800) 272-3900 or email: jdehner@alz.org.